As of January, oikos Berlin has been officially recognized as chapter of the international organization focusing on sustinability in economics and management. 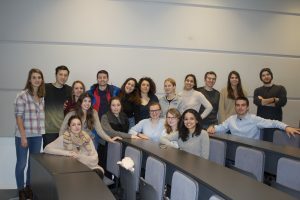 The students of the chapter are studying the Master in International Sustainability Management​ at ESCP Europe and the leading members are currently transitioning in new semester at the Paris campus. With a first meeting disussing the future of the organization, the students decided to focus on three main pillars: education and awareness, community engagement, and professional ecosystem. The students will focus on developing awareness of sustainability in general while generating documentary-style videos. Giving back to the community with volunteering and incorporating green practices in around Paris is also highly valued. It’s additionally important to the students that startups and NGOs connect in networking nights or through consultancy projects or events like the Sustainable Development Goals (SDGs) career week. Currently, the students are focussing on the second installment of the PariGoGreen, which is a festival aimed at raising awareness about sustainability. Partnering with companies and an NGO, the festival brings together students and visitors and educates on the values and practices of sustainability and how they can drive success for businesses and for society.